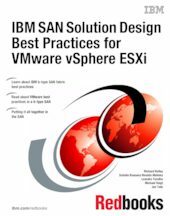 In this IBM® Redbooks® publication, we describe recommendations based on an IBM b-type storage area network (SAN) environment that is utilizing VMware vSphere ESXi. We describe the hardware and software and the unique features that they bring to the marketplace. We then highlight those features and how they apply to the SAN environment, and the best practices for ensuring that you get the best out of your SAN. This book is aimed at pre- and post-sales support, system administrators, and storage administrators.